This section is related to the issue outlined by Yang et al. (2009), which is how relevant is biplot analysis for understanding the nature and causes of interaction? Factorial regression (FR) or partial least squares (PLS) analysis (e.g. Vargas et al., 1999; van Eeuwijk et al., 2005) is useful for studying the effects of both genetic and environmental covari-ables and to develop functional relationships and predictability with explanatory covari-ables. The structural equation model (SEM) using endogenous and exogenous variables is a useful alternative for overcoming some of the limitations of the FR and PLS approaches. In important maize growing areas of the world, grain yield reduction is caused by drought at flowering time as well as low nitrogen content in the soil. Drought delays silking, increases the anthesis-silking interval (ASI) and, therefore, decreases grain yield. Thus, under drought stress, selection for short ASI in maize should be correlated with grain yield improvement, and ASI becomes an important secondary trait with relatively high heritability and more stability than grain yield. Nevertheless, few studies have been conducted on mapping QTLs responsible for the expression of morphological traits under abiotic stresses. typic traits as observed over a set of environments on a set of genetic predictors. FR provides a suitable framework for QEI analysis. Crossa et al. (1999) give examples of how FR can be used for assessing the chromosomal location of QTLs and QEI and the importance of their effects. There are approaches in which the GE is modelled directly using regression on environmental (and/ or genotypic) variables, rather than regression on the environmental mean. A useful linear model for incorporating external environmental (or genotypic) variables is the FR model (Denis, 1988; van Eeuwijk et al., 1996). FR models are ordinary linear models that approximate the GE effects of Eqn 14.1 by the products of one or more of the following: (i) genotypic covariables (observed) x environmental potentialities (estimated); (ii) genotypic sensitivities (estimated) x environmental covariables (observed); and (iii) scale factor (estimated) x genotypic covariables (observed) x environmental covariables (observed). The aim of FR is to replace, in the GE subspace, genotypic and environmental factors with a small number of genotypic and environmental covariables. Vargas et al. (2006) further developed the statistical approaches described by Crossa et al. (1999) and van Eeuwijk et al. (2000, 2002) for modelling QTLs and QEI. The main objectives of their research were to demonstrate the use of: (i) FR for estimating effects and locations of QTLs and QEI; and (ii) FR for modelling and interpreting QEI in terms of products of genetic predictors and environmental variables. be constructed from ratios of regression mean squares to the independent error term. Table 14.5 shows parts of the analysis of variance table for one example comprising a population of F2-derived F3 families evaluated across eight environments differing in the level of drought stress and soil nitrogen content, at position 140 cM of chromosome 1 (Vargas et al., 2006). The first part shows the usual analysis of variance for a two-way table of grain yield measured in 211 genotypes with partitioning of the joint effect of G+GE into G and GE effects. The middle part shows the variability due to QTL+QEI effects in parts of the genome other than chromosome 1 (i.e. due to QTLs on chromosomes 2-10), the variability due to G+GE after correction for QTLs on the other chromosomes, and the corresponding partitioning into G and GE components. Approximately 28.8% of the original G+GE was associated with QTLs on other chromosomes. The last part shows the partitioning of G+GE adjusted for the QTLs on chromomosomes 2-10 into variation due to QTL+QEI at position 140 cM of chromosome 1 and deviations from the QTL-model. For grain yield, Fig. 14.2 depicts the profile of R2qtl, R2qei and R2qtl+qei and the corresponding critical values for a = 0.01 based on 1000 randomizations. There is good reason to believe that there are environment-specific QTLs between 105 cM and 180 cM of chromosome 1 (Fig. 14.2) (QTL+QEI and QEI effects were both significant). In contrast, only main effect QTLs were observed in other chromosomes. The QEI at the end of chromosome 4 and near the end of chromosome 9 were ignored because those QEI peaks did not coincide with the corresponding QTL+QEI peaks. A significant dominant main effect QTL was also found on chromosome 4 (not shown). The environmental covariable that explained the QEI best, at 77.6%, was minimum temperature during flowering (Table 14.5). The effect of this environmental covariable was highly significant by an F-test for the regression mean square over the deviations from the regression (F = 76.675/3.686 = 20.8, p = 0.0038), and even more so when the denominator in the F-test was the intra-block error. Table 14.5. Partitioning of yield variation at position 140 cM of chromosome 1. For comparison, an error estimated from the median intra-block error was 0.75 (adapted from Vargas et al., 2006). G + GE chrom. 1 adj. a For the correction of the grain yield data due to genetic effects on chromosomes 2-10, degrees of freedom might be discounted. b chrom., chromosome; adj., adjusted; Min. temp. flow., minimum temperature during flowering. Fig. 14.2. Profile of R2 for the additive effects of QTL (—), QEI ( ), and QTL+QEI (—) on grain yield for chromosome 1 (additive). 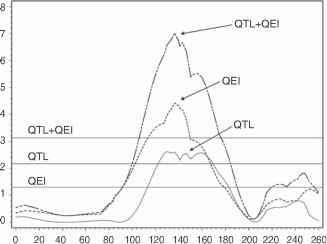 The horizontal lines mark the appropriate threshold for the effects QTL+QEI, QTL, and QEI (adapted from Vargas et al., 2006). When environmental (or genotypic) covari-ables show high collinearity, interpretation of the least squares regression coefficients from the FR is complicated because they are estimated very imprecisely. Noise on the response variable also complicates the interpretation of FR parameters. Furthermore, least squares estimation of parameters in FR models is not unique when the number of covariables is larger than the number of observations; therefore, an alternative estimation method is needed. Partial least squares (PLS) regression can be used. where the matrix T is as in Eqn 14.7, the matrix Q contains the I x 1 vectors called Y-loadings (indexed by genotypes), and F has the residuals. The relationship between Y and Z is transmitted through latent variable T. The PLS algorithm performs separate (but simultaneous) principal component analysis of Z and of Y that allows reducing the number of variables in each system to a smaller number of hopefully more interpretable latent variables. A parsimonious description of the treatment x environment interaction (T x E) occurring in 24 agronomic treatments (tillage, summer crop, manure and nitrogen, N) evaluated during 10 consecutive years (1988-1997) was conducted by Vargas et al. (2001) using FR and PLS. 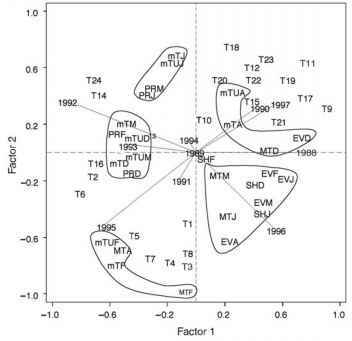 Results of the final multiple FR (MFR) analysis were compared with those of PLS regression to achieve extra insight into the T x E. The MFR was applied on the six most important components of the T x E terms: Year x Tillage, Year x Summer Crop, Year x Manure, Year x N, Year x Summer Crop x N, and Year x Manure x N. Results for the MFR of the 27 environmental covariables x tillage interactions showed that evaporation in December (EVD) x tillage sum of squares accounted for 68% of the whole year x tillage interaction. For year x summer crop, evaporation in April (EVA) accounted for 36% of the year x summer crop. For year x manure, precipitation in December (PRD) and sun hours in February (SHF) contributed 56% of the year x manure sum of squares. Year x N interaction determined the major part of year x treatment interaction sum of squares. Fig. 14.3. Biplot of the first and second PLS (partial least squares) factors representing the Z-scores (latent environmental covariable vectors) of 10 years (1988-1997), and the Y-loadings (response variable vectors) of the 24 practice treatments (T1-T24) enriched with the Z-loadings (environmental variable vectors) of 27 environmental variables. 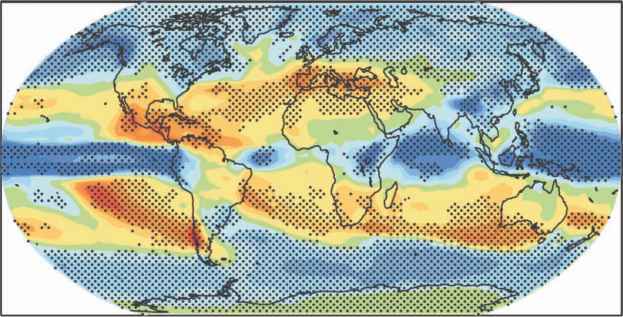 EV, total monthly evaporation; PR, total monthly precipitation; SH, sun hours per day; mT, mean minimum temperature sheltered; MT, mean maximum temperature sheltered; mTU, mean minimum temperature unsheltered; D, December; J, January; F, February; M, March; A, April; N, nitrogen (adapted from Vargas et al., 2001). inclusion of these covariables in the MFR with the stepwise procedure for each factor effect corresponds to selecting covariables for the different cluster groups depicted in Fig. 14.3. SEM comprises a path diagram that reflects the theoretical model and outlines the various levels of observed (or latent) independent or dependent variables, as well as the directions of causal relationships among variables. The functional relationships between variables are represented by arrows or paths. The SEM was proposed by Dhungana (2004) to study GE of grain yield and its components, and to account for the importance of intermediate traits associated with yield components. The author explained yield GE with cross-products of genotypic and environmental covariates as exogenous (independent) variables and observed yield component GE as endogenous (dependent/ independent) variables. 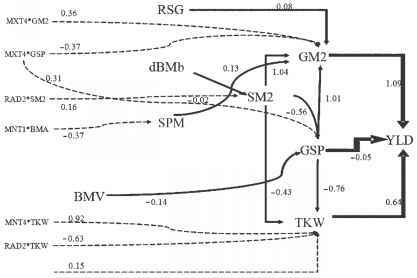 The author concluded that SEM on observed variables was an effective way of describing yield GE in wheat, given that the interrelationships and role of yield component GE can be incorporated simultaneously in a single model. Diagrams representing the structural model known as path diagrams are useful for visualizing complex models and variable relationships. Vargas et al. (2007) showed how the SEM method may be used on observed yield GE, yield components GE, and other intermediate traits, together with residuals from observed cross-product between genotypic and environmental covariates, for studying the causes and effects of GE on grain yield, biomass, yield components, and other interrelated variables acting at different development stages in wheat trials. The proposed model that formulates the hypotheses between the endogenous variables associated with grain yield (YLDGE) and yield components and the other variables (Y) at different stages of crop development, and the adjusted cross-products of genotypic and environmental covariates (X) is given in Fig. 14.4. The given structural equation model explained 0.96 of total variability of yield GE (Table 14.6). The variables that contributed most to explaining yield GE were GEs of yield components GM2, TKW, GSP and SM2 (see Table 14.6 for explanation of terms), with total effects of 1.09, 0.64, 0.56 and 0.54, respectively (Table 14.6 and Fig. 14.5). The GEs of GM2, TKW, GSP and SPM explained 0.90, 0.43, 0.44 and 0.42, respectively, of total variability. Yield component SM2 had a very small R2 value (0.04), but a significant indirect effect on grain yield GE (0.54). The model indicated that GEs of yield components GM2 and TKW had the largest positive direct association with yield GE (1.09 and 0.64, respectively) and no indirect effects (0.0), while GSP and SM2 GEs had the greatest indirect effects on yield GE (0.61 and 0.54, respectively) and a low negative direct effect (GSP = -0.05) or no direct effect at all (SM2 = 0.0) on yield GE (Table 14.6). Fig. 14.4. Proposed model hypothesizing the relationship between yield GE (YLD) and yield components GE, grains per square metre (GM2), thousand kernel weight (TKW), spikes per square metre (SM2), grains per spike (GSP), biomass at anthesis (BMA), spike mass (SPM), relative duration of spike growth (RSG), crop growth rate during spike growth (dBMb), biomass at the vegetative stage (BMV), and adjusted cross-products (Xj of the i th genotypic covariate and j th environmental covariate (i = 1, 2, ..., k; j = 1, 2, ..., l) . Arrows represent the direction of the variables' influence. The ps and bs next to the arrow lines represent the standardized coefficients to be estimated (e.g. bj is the coefficient for effect of the cross-product of the ith genotypic covariate with the j th environmental covariate on yield (first variable)) (adapted from Vargas et al., 2007). Table 14.6. Direct and indirect effects of yield components GE and adjusted cross-product covariates on grain yield GE (R2 = 0.96) (adapted from Vargas et al., 2006). a MXT, mean daily maximum temperature; MNT, mean daily minimum temperature; RAD, solar radiation; suffixes 1, 2, 3 and 4 denote the first, second, third and fourth crop development stage, respectively. Fig. 14.5. Path estimates of the structural equation model for endogenous variables associated with grains per square metre GE (GM2), grains per spike GE (GSP), thousand kernel weight GE (TKW), spikes per square metre GE (SM2), relative duration of spike growth GE (RSG), crop growth rate during spike growth GE (dBMb), biomass at anthesis GE (BMA), spike mass (SPM), biomass at the vegetative stage GE (BMV), and yield GE (YLD), and cross-products (variables x environmental covariates). MXT, mean daily maximum temperature; MNT, mean daily minimum temperature; RAD, solar radiation; suffixes 1, 2, 3 and 4 stand for the first, second, third and fourth crop development stages. Arrows represent the direction of the variables' influence, and the numbers on the arrow lines represent the estimated standardized coefficients. Critical values for a significance level of 0.05, 0.01, 0.001 and 0.0001 are 2.00, 2.67, 3.48 and 4.20, respectively, using a two-tailed t-test with 60 degrees of freedom (adapted from Vargas et al., 2007). The main feature of linear mixed model methodology applied to plant phenotypic data collected in METs is that it allows accurate prediction of genotypic performance by using covariance structures that consider correlations between sites, years and plots in the field, as well as genetic associations between relatives. The genetic covariance between relatives for any pair of related individuals (i and i'), due to their additive genetic effects, is equal to two times the coefficient of parentage (COP = fif), also known as coefficient of coancestry, times the additive genetic variance (i.e. 2fif<j2a = A a2a where A is the additive relationship matrix and <J2a is the additive genetic variance). Using the linear mixed model methodology, the genetic covariance matrix can be estimated and BLUPs can be obtained. The effectiveness of exploiting relationships among strains tested in METs and the usefulness of these BLUPs for simultaneously modelling the main effects of genotypes and GE has been studied by Crossa et al. (2006). The authors obtained BLUPs of breeding values using genetic variance-covariance structures constructed as the Kroneker product (direct product) of a structured matrix of genetic variances and covariances across environments and a matrix of genetic relationships between strains, A. Usually association studies do not include modelling GE simultaneously to the incorporation of matrices Q (representing information from population structure) and A (denoting the additive relationship matrix). Furthermore, COP information is rarely incorporated in association mapping studies. We show how information on covariance among relatives together with population structure and GE can be used to search for relationships between marker polymorphism and phenotypic variability. where X S is the design matrix of 0s and 1s relating Y to the fixed effects of sites (b), and ZR and ZG are the design matrices of 0s and 1s relating Y to the random effects of replicates within sites (r) and genotypes within sites (g), respectively. The random effect e contains random effects of residuals within sites. Vectors r, g and e are assumed to be normally distributed with zero mean vectors and variance-covariance matrices R, G and E, respectively. The variance-covariance matrix G combines the main effect of genotypes and GE. For each Diversity Array Technology (DArT) marker, the BLUPs of the lines were used to create the contrast for testing the null hypothesis of no difference between the BLUPs of the lines with the mth DArT marker = 0 and the BLUPs of the lines with the mth DArT marker = 1. This was done using the variance-covariance matrix of the BLUPs of the lines obtained from Eqn 14.9. An overall test for the null hypothesis was developed and used across all subpopulations obtained from the population structure study. a The location of Lr genes as per USDA-ARS-Cereal Disease Lab (http://www.ars.usda.gov/Main/docs.htm?docid=10342) and other publications. QTLs at these locations were reported in other publications. The significant DArT markers and Lr genes with unknown location are given in the last two columns. markers were found in regions where neither genes nor QTLs have been reported for these traits. Several of the known catalogued genes, such as Lr47, were recently transferred from alien or related species and thus not expected to be present in the material included in this study. Concerning disease traits, the variation of pathogen races occurring at different locations is likely to reduce the identification of race-specific resistance. Most of the known catalogued genes are race-specific and effective only in some geographic areas. In this study, disease pathogens may not have been present at high frequencies in the years when genotypes were evaluated in multiple locations. For example Lr3a (Table 14.7), which occurs in several CIMMYT wheat lines, could not be chosen in this study because virulence to this gene is common worldwide. Virulence to Lr1 is also common in most wheat growing areas, and the gene would have been difficult to detect even if more markers had mapped to the chromosome containing Lr1. Loss of effectiveness due to the presence of virulent races is probably the reason why we could not detect the chromosomal regions for some genes known to be present in CIMMYT wheat materials. Only a few genes, such as Lr34/Yr18, Lr46/Yr29 and Yr30/Sr2, are non-race specific in nature and should have small-to-intermediate effects across different environments. Analyses did, in fact, identify chromosomal regions carrying the above genes (Table 14.7).